New field intelligence vehicle – based on a Ford model – is to arrive in the south for tests. A new IDF vehicle, the "Granite," is on its way to southern Israel for testing in the field. 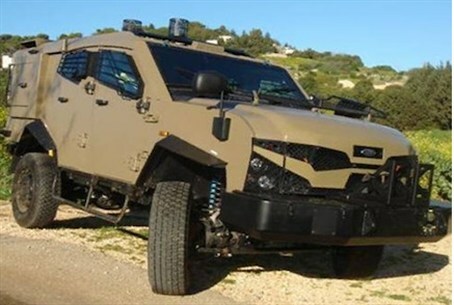 The new vehicle will integrate field intelligence collection systems and strengthen the IDF's current means of intelligence gathering, writes Hadas Duvdevani on the IDF Website. The Granite is based on a Ford vehicle with a new platform. It combines synchronized radars and observation tools that continuously scan large areas and focus automatically on suspicious persons and items. The vehicle also has improved armored protection. IDF forces in the south have recently acquired dozens of new vehicles of different types for routine security operations. The new "Defender" security patrol vehicles will replace the Hummers that are currently used to patrol the expanses of the desert border region of southern Israel.